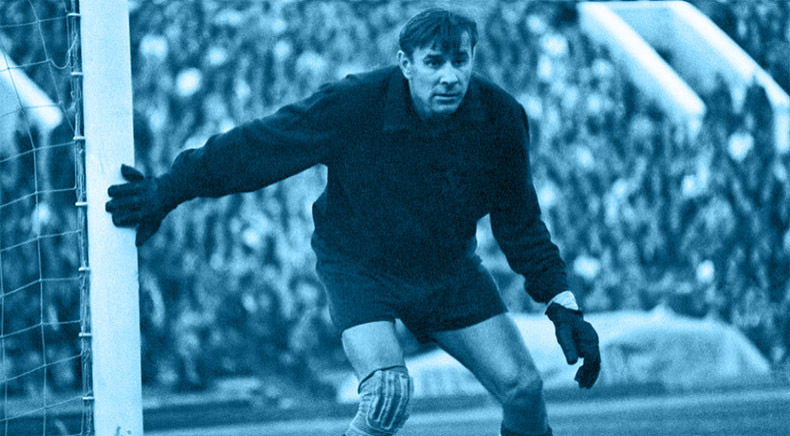 So… what do we know about Lev Yashin? a thrashin’, a thrashin’, a thrashin’. Voted best goalkeeper of the 20th century by the secretive IFFHS. At time of writing, the only goalie to be awarded the Ballon d’Or. Also played in goal for Dynamo Moscow…in ice hockey. Believed to have inspired the aesthetic choices of Johnny Cash (q.v.). I was fortunate enough to see the great man live. 1966 World Cup quarter final. Russia 2 Hungary 1. Yashin was fantastic. I remember frustrated Hungarians thumping the Roker Park turf on several occasions. Poor Hungary on the other hand had a goalie with no arms and a face like his. I never saw him. However, when I was a student, in Coleraine, I lived in the seaside town of Portstewart. Harry Gregg owned a hotel there and in the bar displayed shirts he had swapped when playing international matches, one of which was Lev’s. It was black, his own choice of colour, apparently, as he believed it made him look bigger to onrushing forwards. If I wear this to the Public Service Broadcasting gig tonight, it’s because life is a PB/PSBR, I guess. ^ sorry, typo. The name’s Vysotskiy (or Vysotsky, depending on preference). This first appeared in 2018. When I first referenced it I didn’t notice the author. Is the Goalkeepers’ Union providing journalism training for its members when they hang up their gloves?